Question - What is product mix? Explain product mix decisions. Product mix consists of various product lines that an organisation offers, an organisation may have just one product line in its product mix and it may also have multiple product lines. These product lines may be fairly similar or totally different, for example - Dish washing detergent liquid and Powder are two similar product lines, both are used for cleaning and based on same technology; whereas Deodorants and Laundry are totally different product lines. The width of an organisation's product mix pertains to the number of product lines that the organisation is offering. For example, Hindustan Uni Lever offers wide width of its home care, personal care and beverage products. 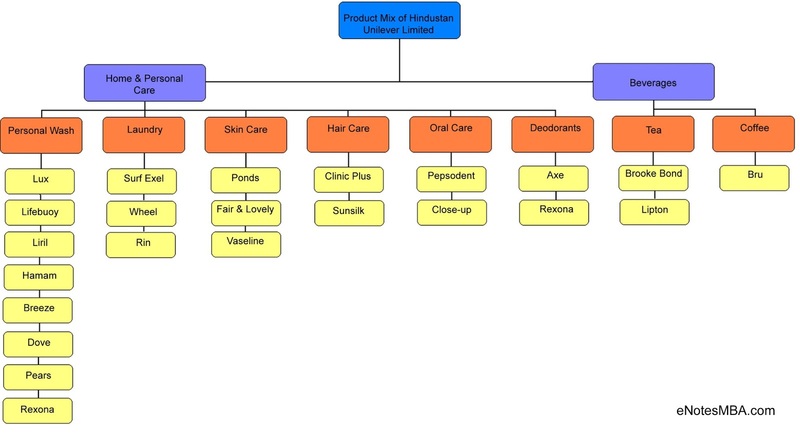 Width of HUL product mix includes Personal wash, Laundry, Skin care, Hair care, Oral care, Deodorants, Tea, and Coffee. The length of an organisation's product mix pertains to the total number of products or items in the product mix. As in the given diagram of Hindustan Uni Lever product mix, there are 23 products, hence, the length of product mix is 23. 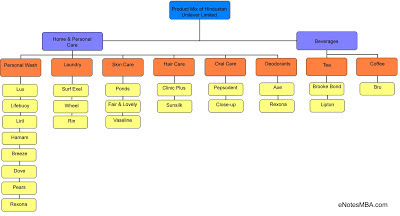 The depth of an organisation's product mix pertains to the total number of variants of each product offered in the line. Variants includes size, colour, flavors, and other distinguishing characteristics. For example, Close-up, brand of HUL is available in three formations and in three sizes. Hence, the depth of Close-up brand is 3*3 = 9. The consistency of an organisation's product mix refers to how closely related the various product lines are in use, production, distribution, or in any other manner. Product mix decision refers to the decisions regarding adding a new or eliminating any existing product from the product mix, adding a new product line, lengthening any existing line, or bringing new variants of a brand to expand the business and to increase the profitability. Product Line Decision - Product line managers takes product line decisions considering the sales and profit of each items in the line and comparing their product line with the competitors' product lines in the same markets. Marketing managers have to decide the optimal length of the product line by adding new items or dropping existing items from the line. Line Stretching Decision - Line stretching means lengthening a product line beyond its current range. An organisation can stretch its product line downward, upward, or both way. Downward Stretching means adding low-end items in the product line, for example in Indian car market, watching the success of Maruti-Suzuki in small car segment, Toyota and Honda also entered the segment. Upward Stretching means adding high-end items in the product line, for example Maruti-Suzuki initially entered small car segment, but later entered higher end segment. Two-way Stretching means stretching the line in both directions if an organisation is in the middle range of the market. Line Filling Decision - It means adding more items within the present range of the product line. Line filling can be done to reach for incremental profits, or to utilise excess capacity.